Mauritius Listeni/məˈrɪʃəs/ (French: Maurice), officially the Republic of Mauritius (French: République de Maurice) is an island nation in the Indian Ocean about 2,000 kilometres (1,200 mi) off the southeast coast of the African continent. The country includes the islands of Mauritius, Rodrigues, 560 kilometres (350 mi) east of the principal island, the islands of Agaléga and Saint Brandon. The islands of Mauritius, Rodrigues and the French department of Réunion 170 km (110 mi) form part of the Mascarene Islands. 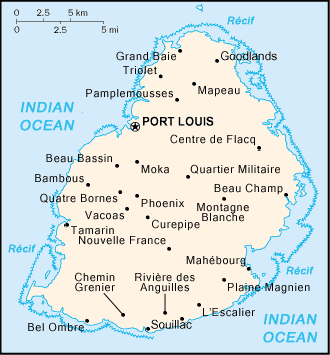 The area of the country is 2040 km2, its capital is Port Louis.